A unique park that transforms a formerly blighted urban industrial site into a regional bird sanctuary. Scioto Audubon Metro Park is 160 acres of restored wetlands and bird habitat on a reclaimed urban brownfield adjacent to Downtown Columbus. 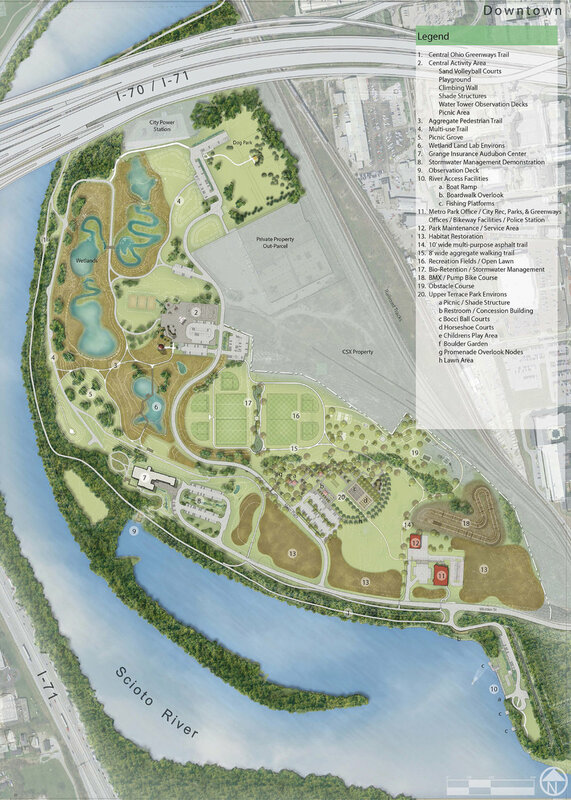 The open space is positioned within a unique riverine ecosystem on the Scioto River and provides an incredible diversity of restored natural wetland and prairie areas juxtaposed against skyline views of the city. MKSK worked with Columbus and Franklin County Metro Parks, the City of Columbus, and Audubon Ohio to develop the Park Master Plan and was engaged as the Landscape Architect in the phased development and implementation of the park. Walking trails, wetland boardwalks, and bike paths connect to the regional bikeway system, adjacent neighborhoods, and downtown. The park offers many different ways for visitors to enjoy the space including an aviary habitat observation deck, land lab wetland environs, one of the nation's largest outdoor climbing walls, observation tower, hierarchy of trail systems, volleyball, open recreation athletic fields, boat ramp, fishing pier, custom tensile shade structures, play equipment, picnic facilities, dog park, and restorative native plantings and prairie. The vision for this unique urban park space included wetland habitat restoration and establishing a living laboratory within an integrated educational environment. Everything designed within the park is a lesson in sustainable development and conservation through the use of innovative ‘green’ technologies. To allow visitors to easily navigate the site, a comprehensive park-wide signage and wayfinding system was also developed.